Planetside 2 is a very unique game. Unique in that it pits, often, thousands of players in a head-to-head-to-head first person shooter engagement. Sometimes these engagements can be very large and very condensed over a small area of terrain. With a lot of shooting comes a lot of network traffic. Having a hiccup in your network connection or your little brother downloading some large file while you play can mean death, or at the very least some interesting faces of lag. Perhaps you have come to this article because you have experienced lag. Maybe you haven’t yourself but you have heard the horror stories and want to avoid it entirely. Well, you’ve come to the right place, in either case. I’ve read a lot about ways to optimize your connection and some of it involves some serious hacking and slashing of your computer’s configuration in questionable ways. Being a computer networking guru, I went right to the source and configured my router using QOS, better known as Quality of Service. QOS allows you to configure, at your router, which traffic gets priority over other traffic types. On most home routers that have QOS, you only have a few options and I’ll go over the three easy and popular options that some of us here at theVanu Rangers have implemented. And before I begin I’m going to say this right away: I can not provide step-by-step instructions for every single router out there. There are far too many to keep track of or even attempt to provide instructions for. I use a Linksys E1550 and it provides the QOS options that I need. In the past I have used Netgear routers to the same effect. Many routers have QOS enabled and they make the configuration fairly simple (at least on your home/consumer-level routers). If you run into confusion or other issues when making these adjustments, then please find instructions to set up QOS in general for your particular router – the answers are just a Google search away. I use this because it is the most precise of the methods although a little more involved (but not terribly involved). It essentially targets and increases priority of only Planetside 2 and leaves the rest of your traffic completely untouched. I use a DSL connection with a 6 mbps downstream and 1 mbps upstream – compared to connections that most have, this is pitiful but by using QOS I’m able to get online and play Planetside 2 without any issues, even with two SmartTVs in the house that are almost always streaming movies on Netflix. UDP 20040 – 20199 – Used for Login, Character select, and world/zone data. Essentially the meat and potatoes of ingame data. UDP 5062 – Used for ingame voice, however this port number changes dynamically making it hard to nail down in the event that the game decides to use a different and random port. Although I have very rarely seen it change. Note: The patcher uses the standard ports of 80 and 443 to download patches, which are the same ports used for typical web browsing and downloading files from webservers. So by prioritizing ports 80 and 443 along with the two port ranges I listed above, you’d be potentially accomplishing nothing if someone hops on Netflix on your SmartTV and starts watching a movie. So, depending on your router’s configuration steps for QOS, you’d give port range 20040-20199 on UDP highest priority and do the same for 5062 UDP and you are done. QOS by Router Port lets you select a physical port on the router and prioritize all traffic going to or from it over all other network traffic. On a standard home router you’ll have typically 4 ports on the back to connect a computer to with a hard wire connection using a Category 5 or 6 cable. In your router’s QOS configuration simply select the port that your computer that you play Planetside 2 is on and give it the highest priority and you are done. Be warned that this isn’t precise and it prioritizes everything – so if you are downloading something with the same computer that you play Planetside 2 on, you will essentially have no effect. It only gets priority in relation to other computers on the network. This is very similar to the previous method of selecting a router port. Instead of selecting a physical port, you are going to select the MAC Address of your computer. Similar to an IP address, a MAC address is unique to that computer and it never changes. 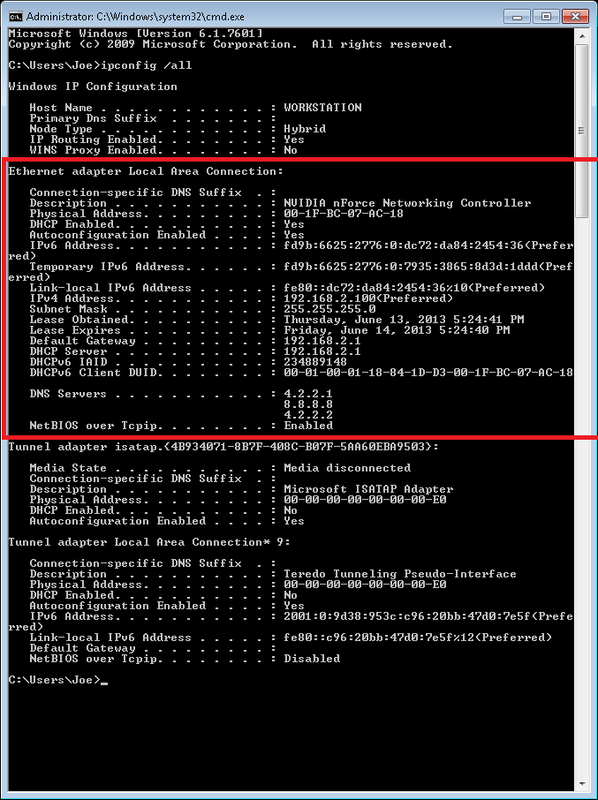 Often times called a hardware address, the MAC address is unique to the actual network device within the computer, so it is very specific. A computer with a physical ethernet card and a wireless network card, will have two MAC addresses – this is something to pay attention to if you use a laptop or your gaming rig desktop motherboard has two ethernet ports on the back. NOTE: QoS by MAC Address, or layer 2 QoS is preferred over an IP address, which is layer 3. The higher the layer, the most CPU resources are required by the router to process each packet of data. The router port is ideal because it is layer 1 and requires the least amount of computational power by the device doing QoS (your router). You can either locate your MAC Address via your router’s configuration (which I won’t go into here) by looking at, what most router manufacturers call “attached devices” and finding your computer’s name in the list or you can look it up on your computer. I’ll go through simple steps of looking it up on a Windows 7 computer, which will apply to most Windows-based computers as of the time I write this article. 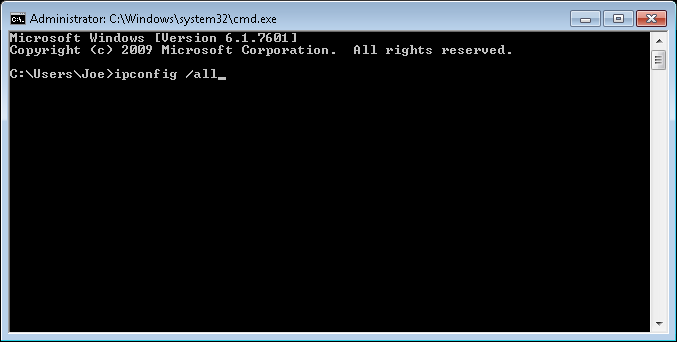 Step 2: Type cmd into the window and click OK. A black window should come up. 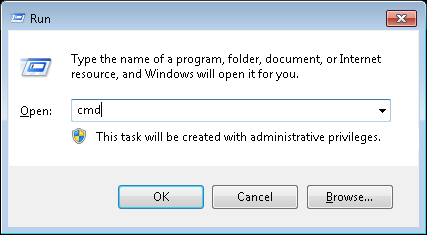 Step 3: Type ipconfig /all into the black box window and click OK. A bunch of information should get spit out. We are looking for the section that I’ve boxed off in red below. In my case I’ve identified it because it actually has an IP address assignment, gateway information and DNS information – a disconnected network interface will probably not have that information or it will say Media disconnected as a Media State status. The physical address or MAC Address should be 6 sets of 2 characters each separated by a hyphen. This is the information you will have to feed your router to give your computer’s MAC address priority over all others. Some routers require it to use colons (:) instead of hyphens and other routers provide 6 separate text boxes for each pair of characters. It will be made clear to you when you set this up. And just like the router port method, this method prioritizes EVERYTHING that your computer is doing on the internet over all other computers, so if you are downloading a large file, you will probably slow down your connection for Planetside 2. What are your results from this guide? What steps did you follow? 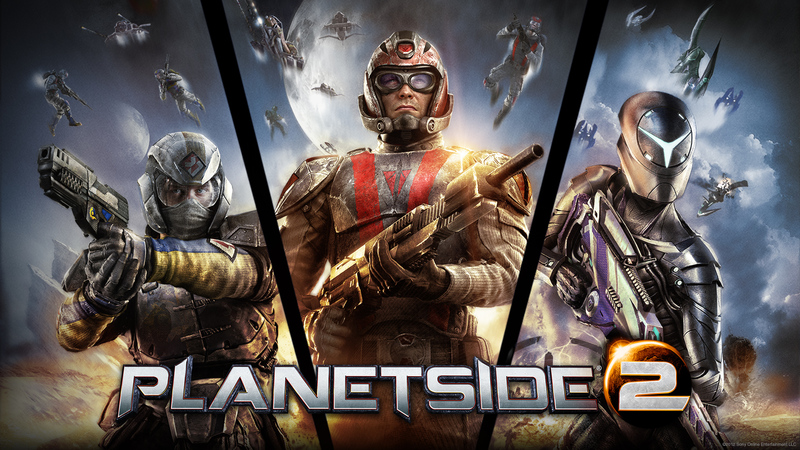 What else have you done to improve your Planetside 2 performance?